The temperature is (slightly) dropping here in D.C. and that got me in the mood for some autumn comfort food. I also just got notice that the vegetarian cookbook I pre-ordered back in spring is finally on it’s way! It’s called the ‘The Meat Lover’s Meatless Cookbook: Vegetarian Recipes Carnivores Will Devour‘ by Kim O’Donnel. Kim is also the person who inspired me to start my own food blog. Since reading her writing and hearing a lot lately about the ‘Meatless Monday’ movement, James and I have incorporated more vegetarian eating in our house. 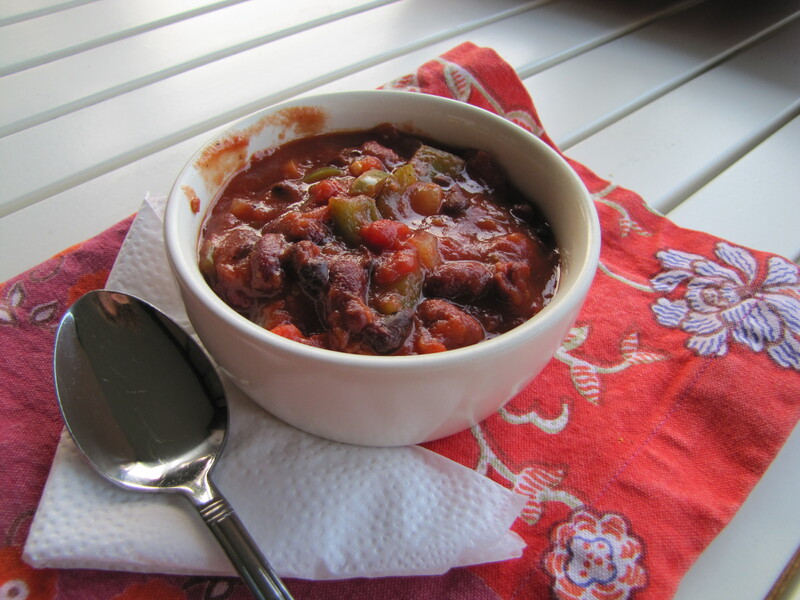 So to start off the season and in celebration of her book, here’s a fabulous, savory and comforting chili. Enjoy! 1. In a large soup pot, saute garlic until fragrant, about 30 seconds. Add onions and saute for another few minutes. Add tomato paste and flour and continue to saute. Add peppers and jalapenos and saute for another few minutes until soft. 2. Add beans and tomatoes and stir. Add salt, pepper, chili spices, brown sugar and bay leaf. Stir. Let simmer for at least 30 minutes. Then, 30 minutes before you’re ready to serve, pour in carrots. Serve with cornbread or over rice. Emily, thanks for the sweet shout out. Hope I can see you when I’m DC to sign your copy! Keep the spirit of cooking alive.